World War II was one of the defining moments in British History. Almost every family in the UK was touched by the war in some way. Unlike many conflicts, WWII directly impacted regular people - during the Battle of Britain and The Blitz. There are several locations in Britain today where you can explore the history and walk in the footsteps of those who fought and led in WWII. The dangers of German bombers and V2 rockets forced many citizen of London into underground bomb shelters. The government had to seek the same shelter to conduct the war. Plans for an underground bunker for the government were developed as early as the 1920s and the cabinet war rooms became operational on August 27, 1939, just 1 week before the invasion of Poland. Today the facilities are open and you can see where the wartime cabinet met. 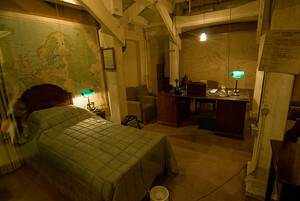 You can also view the private quarters of Churchill, although he seldom actually slept in the bunker. One of the best collections of weapons and war memorabilia is at London's Imperial War Museum. Located in central London it is one of the finest military museums in the world and admission is free to the public. It includes not only items from WWII, but from WWI to the present. 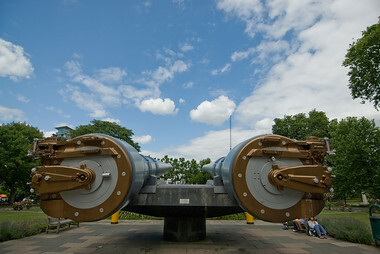 The giant 15" battleship guns outside the museum saw action in both WWI and WWII. The museum also operates the HMS Belfast which is docked as a museum in London. 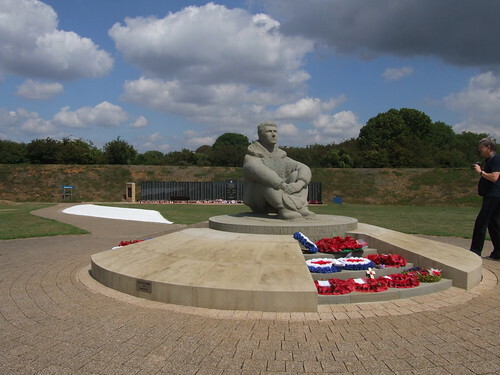 The Battle of Britain Memorial honours those who gave their lives and served in the air battle known as the Battle of Britain. Located on top of the famous White Cliffs of Dover, the monument consists of a statue of a sitting pilot looking out to sea and a wall of remembrance with the names of those who gave their life inscribed. The Battle of Britain Museum in Kent is one of the finest collection of military aircraft in the UK. Here, where the Battle of Britain was fought, you can see the actual Spitfire and Hurricane aircraft used during the battle. The museum is a former RAF Station Hawkinge, which is where many of the aircraft used in the battle were stationed. The museum is a short drive from the Battle of Britain Memorial. One of the most important events in WWII was something almost no one knew about at the time: the cracking of the German Enigma code. Alan Turing and his team at Bletchley Park, working in total secrecy, managed to decrypt German secrets which gave the allies a decisive advantage in the war. At Bletchley Park you can view original German Enigma machines as well as a reconstruction of the 'bombe' machine used to decrypt German codes. Extra note from VisitBritain: Another gem hidden in Lincolnshire (known as 'Bomber County' during WWII due to its 54 airfields) is the RAF Battle of Britain Memorial Flight visitor centre at RAF Coningsby where you can see and learn about the iconic aircraft and crews that helped keep Europe free.